Rapid deforestation in the Virunga National Park in the Democratic Republic of the Congo is threatening its fragile ecosystem and over half the world’s population of highly endangered mountain gorillas. Meanwhile, for Goma’s burgeoning population, spending a high proportion of their income on illegally plundered charcoal keeps them locked in poverty. WWF is training local businesses to build and sell cheap, culturally appropriate stoves that halve the amount of charcoal needed, so helping protect the sensitive forest environment. It’s also helping landowners start sustainable tree plantations for charcoal, to help meet Goma’s needs and reduce deforestation. It’s really exciting that a conservation charity is stimulating the clean cookstove market to reduce deforestation. It’s even more impressive that WWF has achieved such swift penetration of the market in Goma despite the recent conflict. The city of Goma in the Democratic Republic of the Congo has grown rapidly in the last decade, with a constant influx of internally displaced people and rural migrants. Incomes are low, so most people use simple charcoal stoves for cooking. It is thought that about 80% of the charcoal is produced illegally in the nearby Virunga National Park – an area of huge importance for biodiversity, and home to endangered mountain gorillas. WWF recognised that charcoal use is a major threat to the Park, and set about tackling it in ways that bring economic benefits to local people, as part of a wider programme to help Virunga by supporting local development. WWF-DRC has established local production of efficient charcoal stoves which cut the use of charcoal, and at the same time helped to start small tree plantations to sustainably supply the charcoal market. WWF is an international NGO that works in over 100 countries on policy and projects that support its aim “to build a future in which people live in harmony with nature”. 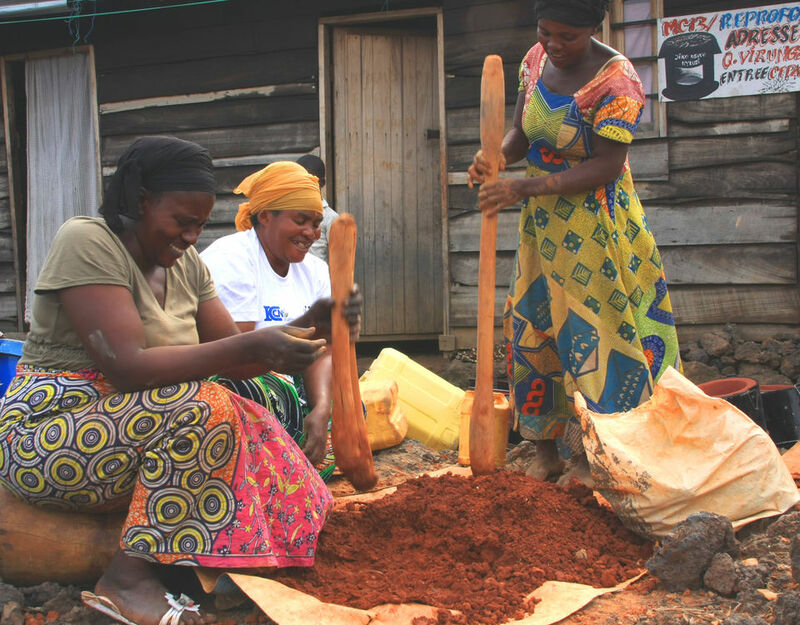 The improved stoves and plantation projects in the North Kivu province of the Democratic Republic of the Congo started in 2008, with the first stoves produced in 2009. The project had five staff and grant-funded income of US$117,000 in 2011-12. A 2008 study of the charcoal market in Goma by the African Conservation Fund estimated that 59,000 tonnes were consumed each year, with 80% coming from Virunga. WWF projected that, without intervention, charcoal consumption would increase to about 80,000 tonnes/year by 2013 because of the rapid growth in the population of Goma. This would degrade over 18,000 hectares of Virunga in one year. A WWF survey of cooking in Goma in 2008 found that 90% of households cooked using charcoal, but only 7% used any type of improved stove; most others used the traditional ‘Foyer malgache’. The Jiko Nguvu Nyeusi stove is much cleaner to use. It’s easy to light and gets up to temperature quickly: that’s really important for me because I have ten people in my family to cook for. I work in the hospital as a midwife, so I tell the young mothers about the improved stoves. Together, these studies showed the huge impact of charcoal use on the crucial habitat of Virunga, but also the significant potential to cut charcoal use with improved stoves, provided that stoves which appeal to Goma families could be produced at an acceptable price. How was the technology developed? Rather than design a new stove from scratch, WWF ran trials with users on seven existing types of improved stove, and from these selected three which, with minor modifications to suit local needs, could quickly be brought into production in Goma. All three were liked by users, and laboratory and field tests confirmed that they substantially reduced charcoal use, compared with the traditional Foyer malgache. The most popular model was the ‘Jiko Nguvu Nyeusi’ (Black Power Stove). This has a perforated ceramic liner, which is cemented into a cylindrical metal body with pot rests, carrying handles and an air-control vent. Detailed kitchen performance tests showed that cooking with a Nguvu Nyeusi uses about 0.51 tonnes/year of charcoal, compared with 1.02 tonnes/year for the Foyer malgache. How is it manufactured, promoted, and maintained? 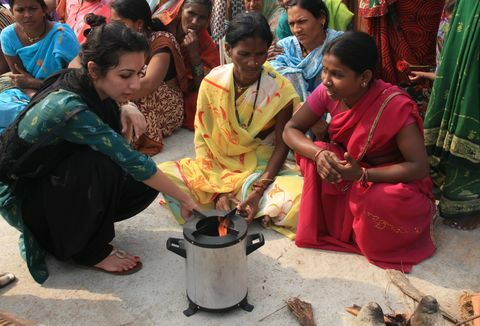 WWF wanted to build a local supply chain for stoves that would become self-sustaining. They therefore trained existing associations of women and men to produce and sell the stoves, and helped set up new associations. Follow-up training and regular inspection visits keep a check on production quality. The liners are hand-made from clay by women’s associations, and the metal stove bodies by men’s associations. The women buy the stove bodies, fit the liners to them using a cement mix, and paint and finish the completed stoves. WWF helped associations obtain materials through bulk purchase and working capital loans: this is now managed through the trade association ‘Reseau des Producteurs des Foyers Culinaires Ameliores’ (REPROFCA) which was set up in 2012. Producers are encouraged to innovate, provided that they meet WWF quality and performance standards: for example, the recently-developed REPROFCA stove, which has insulation around the ceramic and a cement base, is proving popular. We used to be cooks, but it’s not reliable work. But because I love cooking, it’s good to make stoves. It’s hard work but we enjoy it – and I earn about US$25 per week. 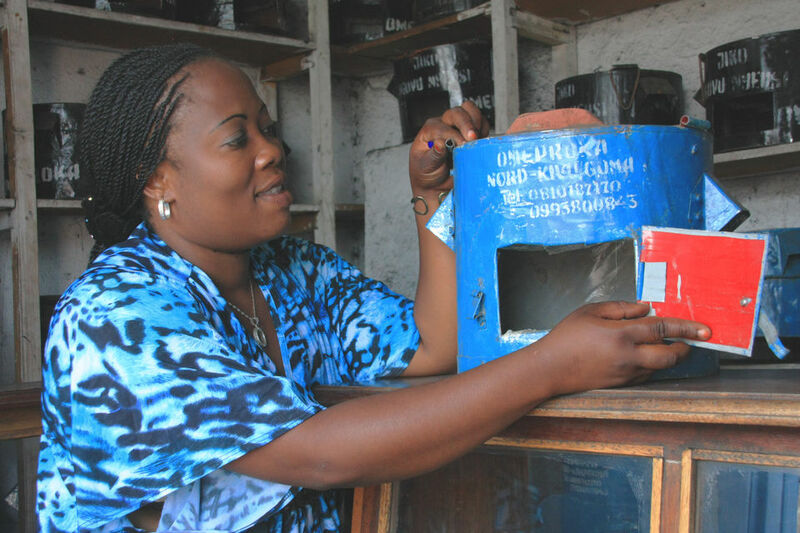 The women’s associations sell the finished stoves through retail outlets in Goma, and also to traders who sell them in other towns in the DRC. Retailers explain to purchasers how to cook with the stove, and provide an information leaflet in Swahili, which has the name of the association and a helpline number. Stoves are sold with a one month warranty, but will be replaced free of charge beyond this time if the manufacturer appears to be at fault. Stoves last for about two years in normal use, and both liner and body can be brought back to the sales outlet or a production site for repair. Because of the popularity of the Jiko Nguvu Nyeusi, other producers now also make them to WWF designs, and WWF helps them with advice. WWF found that their most successful marketing was through a radio show with a popular host: in a 2011 survey, 43% of users said that they had heard about the stove on the radio. Neighbour recommendation (31%) and public demonstrations (9%) were also mentioned. One of the reasons that improved stoves were not widely used in Goma before 2008 was the difficultly of sourcing raw materials. Goma is on volcanic soil and does not have clay, so WWF helped source supplies from two major sources, both 70 km from Goma. Sheet metal is also imported in bulk from Uganda and Kenya. This has improved stock levels and cut costs. Standard-sized Nguvu Nyeusi stoves retail for about US$5, REPROFCA stoves for about US$10, and larger household models for up to US$15. Institutional-sized stoves are also available for up to US$30. Customers pay the full amount up-front in cash. Initially there was a WWF subsidy of US$0.50 per stove for the Nguvu Nyeusi models, but this has been phased out. In 2008, WWF planted trials of different species of tree which could be used to produce charcoal, to check their viability, and also tested simple improved charcoal kilns. These are based on traditional kilns (stacks of wood covered by earth) but with careful procedures for stacking, and a chimney and vents to control air flow. WWF then worked with existing farmers associations to encourage individual farmers to establish small tree plantations (average 2.5 hectares) for charcoal production. Associations which enter into a contract with WWF are provided with seeds (mainly Eucalyptus species) and other inputs, along with training in tree management and charcoal production. The stoves light easily and cook quickly; they’re sturdy, well made. We used to get through a sack of charcoal a every day or day-and-a half; now a sack lasts two days to a week. And we’ve got more customers; people like the fact the food cooks quicker and some even say it tastes better too! From July 2009 to the end of March 2013, a total of 44,622 stoves have been produced by associations affiliated with WWF. Sales records show that 24,406 of these were sold in Goma, the others to traders for sale elsewhere. Assuming a lifetime of two years, about 28,000 stoves are currently in use, of which 16,000 are in Goma. With an average household size of six people and 1.33 stoves per household, about 120,000 people are benefitting. 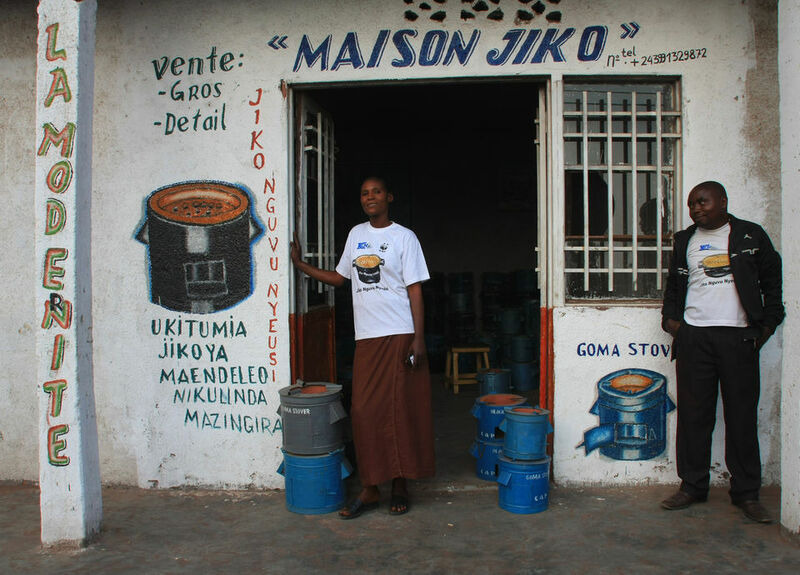 In late 2011, WWF carried out a follow-up survey of 1,348 households in Goma, and found major changes in stove choice. The survey showed that 44% of households were using Nguvu Nyeusi design stoves and 15% were using other improved stoves, compared with just 7% using any type of improved stove in 2008. 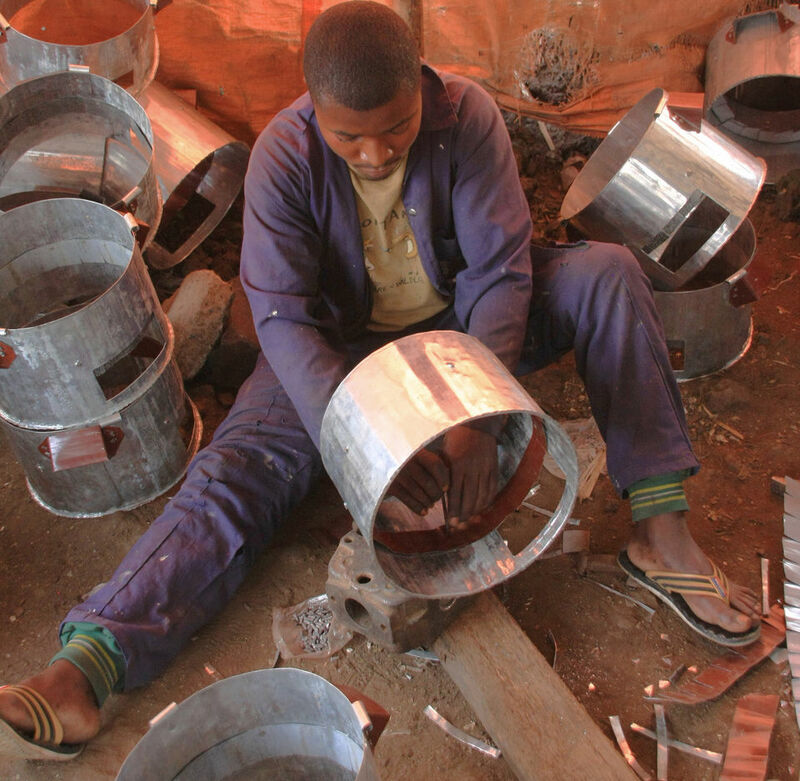 Around half the Nguvu Nyeusi stoves were made by producers not affiliated to WWF, but were of equivalent quality. These results show that the WWF programme has resulted not just in direct sales but also stimulated wider interest in improved stoves and led to the whole market growing. The plantation programme has also made significant progress. 3,900 hectares of land are currently under plantation, and commercial harvesting will start in 2013. Stoves made by WWF affiliates are currently saving about 14,000 tonnes/year of charcoal. This means that they will protect about 4,200 hectares of forest from degradation in 2103. Crucially for WWF, around 1,800 hectares of this forest are in Virunga. But the survey results suggest that the impact of the WWF work is much greater, because of non-affiliated producers using the WWF design. 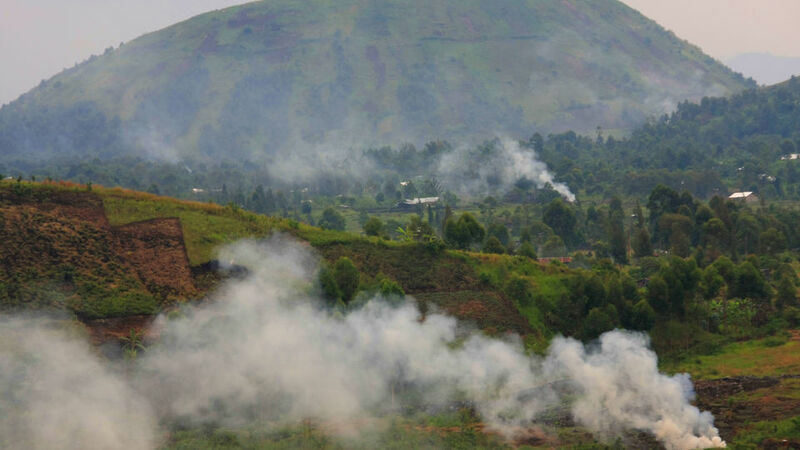 Use of their stoves in Goma saves an additional 11,000 tonnes/year of charcoal and thus protect a further 3,300 hectares of forest in 2013, of which 2,700 hectares are in Virunga. Thus the major environmental aim of WWF has been achieved: to have a substantial impact on reducing deforestation in Virunga. We sell 100-200 stoves a week. We know how to make them, so deal with any minor repairs ourselves. Lots are bought by traders who ship them down to Bukavu. We take customers through the stove leaflet, make sure they understand. If they can’t read, we explain it all, step by step. Reducing the use of unsustainable wood for charcoal also benefits the global environment, by cutting greenhouse gas emissions. The charcoal saved by Nguvu Nyeusi stoves (from WWF affiliates and others) avoids the emission of about 200,000 tonnes/year of CO2 e.
Users are enthusiastic about the stoves and keen to buy them – and the sales records show that this is not just in Goma where they were originally targeted, but also elsewhere in the DRC. A major reason for their popularity is the money saved through using an improved stove. With charcoal costing about US$0.60 per kg, a family saves US$400 per year. This is typically 10 to 20% of household expenditure, and savings are increasing as the price of charcoal rises. The cost of the stove is recovered in two weeks or less. Users also like the practicality of the stoves – the speed at which they get up to temperature, the absence of sparks, smoke and ash, and the stability, so that stoves don’t fall over when heavy pots are put on them. The stove programme has generated significant local employment and income, particularly for women. The 63 associations WWF work with in Goma have over 800 members, about 600 women and 200 men. Associations operate piece work and fix their own rates, with women earning about US$1 per completed stove, and men about US$0.50 per stove body. Producers outside the WWF programme are also benefiting. The trade association REPROFCA is taking over responsibility for overseeing production in Goma, and also for providing working capital loans for members. 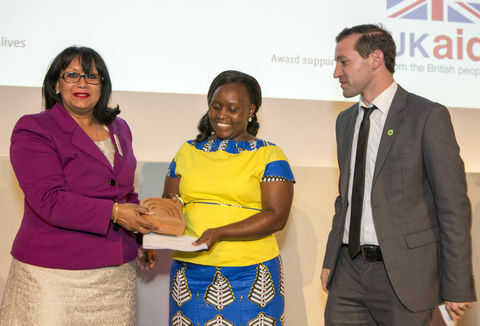 WWF has made a US$20,000 interest-free loan to the association, for this purpose. WWF will move to a more advisory role in Goma, and expand the production project to new areas, initially towns in the northern part of North Kivu province. The current plantations will be supplying about 12,000 tonnes of charcoal each year by 2015 when they are in full production. Recent funding will enable additional planting to take place over the next few years, and thus increase this supply.